RAK Winners! and a great new layout!! Please email customerservice@fancypantsdesigns.com with "Blog Winner" in the subject line asap (we'll have to draw a new name if we don't have your info by Wed. Feb. 21st!) . Include your name and address info so we can get this out to you next week!! YEAH! And... one of our fabulous designers, Amber Tosh, sent this layout to me this morning and with Valentine's Day and all, I thought it was super cute and needed to be posted! We're still experiencing some difficulty with our idea gallery, so this is a great option for posting our latest designs! 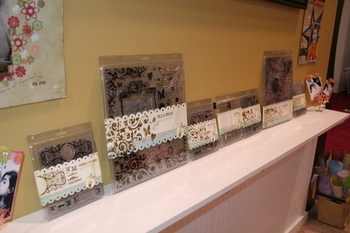 Layout supplies include papers from our Aged Florals collection, lots of NEW and "old" chipboard stuff (big heart, swirls, hearts, letters) and one of our new Creative Cards journaling cards!! Enjoy and TFL!! CHA . . . a blast! Well, I am actually still here in Cali getting ready to head home tomorrow...if the kiddos can survive the 11 hour trip in one day!! We'll see how that one goes. Maybe they'll just sleep the whole ride from pure exhaustion..I think I could! I know that there are lots of posts already out there, but I thought I'd post a few of my own for you all to see. The product will be arriving at our warehouses as early as next week so we'll be drawing names for the free goodie packs!! Just a little look at where we lived for four days :)! It really wasn't too shabby...we had lots of fun product and projects to keep us all busy! 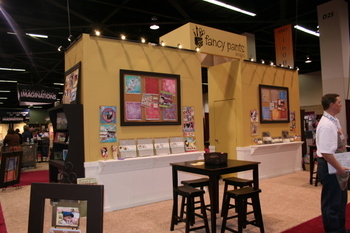 Thanks for all of your support of Fancy Pants products.. we can't wait to see what you do with all of the new releases!! 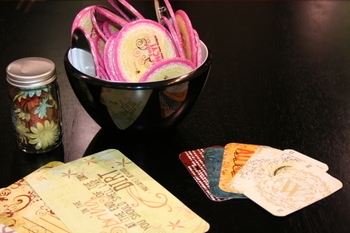 Don't forget to leave your comments to be entered into the RAK's... we'll be picking a handful next week! !